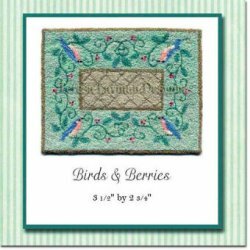 Birds and Berries All miniature rug kits come beautifully packaged with a cover photo of the finished design and include the following: Fine line design printed on high quality muslin 2 fine English embroidery needles Instructions, stitch diagrams and Color key You supply the floss, hoop and scissors. 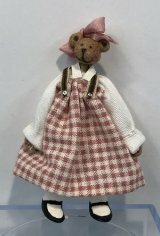 The tiny designs lend themselves to using bits and pieces and partial skeins of floss that you may have leftover from a different project. Substituting colors and other fibers (Rainbow Gallery s Mandarin is nice) is also a wonderful thing.